Description: Narrated by the visionary founding member, Hell’s Angel provides a fascinating all-access pass to the secret world of the notorious Hell’s Angels Motorcycle Club. 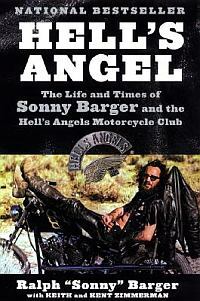 Sonny Barger recounts the birth of the original Oakland Hell’s Angels and the four turbulent decades that followed. Hell’s Angel also chronicles the way the HAMC revolutionized the look of the Harley-Davidson motorcycle and built what has become a worldwide bike-riding fraternity, a beacon for freedom-seekers the world over. Dozens of photos, including many from private collections and from noted photographers, provide visual documentation to this extraordinary tale. Never simply a story about motorcycles, colorful characters, and high-speed thrills, Hell’s Angel is the ultimate outlaw’s tale of loyalty and betrayal, subcultures and brotherhood, and the real price of freedom.